From food cravings to telling off grumpy colleagues, some habits are hard to avoid even on our best days. We've rounded up these mindfulness reads so you can flourish in every facet of life—even during those tough times. We’re forever reaching for something that will bring us pleasure: coffee, a Facebook post, a kiss, or something more sinful. We rev up our craving engine in the morning and give it few breaks through the day. What’s up with that? Why so needy? As director of research at the Center for Mindfulness and developer of smoking cessation and mindful eating apps, doctor Judson Brewer has a few things to say about that. Both a lab researcher and a psychiatrist, he has tried to figure out how we get ourselves into habits that adversely affect our health and how we can release ourselves from their grip. A little bit of understanding goes a long way, in Brewer’s view, so it helps us to know that we’re built to crave. Drawn toward what nourishes us, we’re rewarded with a good feeling, and the brain lays down a memory. That mechanism—trigger-behavior-reward—served our ancestors well when it came to learning where to find food and avoid toxins. But then a funny thing happened on the way to the watering hole: We started applying this mechanism to things that made us feel good, like smoking or gorging on sugary snacks, but that had long-term negative consequences. We hijacked a powerful evolutionary system for short-term gain at the expense of long-term pain. The awesome power of this system accounts for why habits are so hard to break. But then along comes mindfulness. Through repeatedly paying attention to how our mind and body behaves, at a moment-to-moment level, we can “see through” our “self-centered reactivity,” Brewer says. We can then interrupt the habit loops ingrained in our memory, and also use our built-in reward engine to foster habits that bring short-term pleasure and long-term benefit. We’re built to crave. Drawn toward what nourishes us, we’re rewarded with a good feeling, and the brain lays down a memory. Human beings are a fearful, self-critical lot who all too often increase our pain by internalizing emotions like fear, shame, and anger. “Everyday discomfort may be inevitable, but mind-made misery is avoidable,” writes Jerome Murphy, the former dean at the Harvard Graduate School of Education. “You can learn how to constructively handle the pressures and discomfort you encounter without making them worse.” Murphy uses dancing—preferably in the rain—as a metaphor for living fuller lives in the midst of life’s inevitable storms. So, rather than resisting life’s challenges, focus your energy on seeking inspiration, fostering kindness to yourself and others, and slowing down. “Are you getting enough sleep?” These days the answer to this question seems almost too predictable, as the struggle for sleep affects the lives of millions of Americans. Yet not everyone’s struggle is the same; many factors can contribute to a lack of sleep. Dr. Meir Kryger, a sleep specialist and professor in the Yale School of Medicine, offers a thorough resource for anyone looking to figure out why they don’t get enough sleep so they can find the right treatment for their situation. The Mystery of Sleep reveals the many nuances of sleep, from body clocks and hormones to how much sleep humans require during each life stage, and why. This comprehensive book offers a solid ground on which to explore what you may need to do in order to get a better night’s sleep. It may be surprising that a MacArthur Fellow and Ivy League professor ever felt she wasn’t smart enough growing up. But it caused Angela Duckworth to devote her career to researching the psychology of achievement. What she discovered is that wild success in life, in any endeavor, isn’t caused by good genes or extraordinary talent. Instead, it comes down to one overarching trait: grit. Duckworth defines the “grittiest” among us with the following qualities: ferocious determination, unusual resiliency, ability and desire to work really hard, and knowing in a very deep way what you want. Importantly, they also have optimism, the belief that you can change your situation. Best of all, Duckworth tells us, these qualities can be developed. Methodically researched and packed with examples of “grit paragons”—from Olympic athletes and heads of industry to those who’ve made the absolute best circumstances out of very little—this important book is at once fascinating… and hopeful. Is mindfulness for children? Many teachers say yes. And early research suggests it enhances well-being and improves the classroom environment. But mindfulness for children doesn’t equate simply with sitting meditation, which can be a challenge for young people (not to mention all of us at times). It’s also not just for the classroom; it can be an at-home pastime that can help a child or teen and the adults who read this book and introduce them to the activities inside. Susan Kaiser Greenland knows this work well, having helped to pioneer activity-based mindfulness in her first book, The Mindful Child. Her new book offers 60 road-tested activities built around six life skills—focusing, quieting, seeing, reframing, caring, and connecting—that help children and teens be more aware of what’s happening in their minds and bodies, and wiser and more compassionate. The exercises are also safe and effective for parents, grandparents, teachers, therapists, camp counselors—children of any age. Suze Yalof Schwartz once lived the fast-paced, high-pressure of New York City fashion magazine editing—and then she found meditation. Now the owner of LA’s Unplug meditation studio, Yalof Scwhartz wants to demystify the practice to those she believes need it most: People like her. This simple little book offers a straightforward approach to starting a meditation practice, with tips and tools that newcomers will surely find reassuring. A friendly introduction to the world of meditation, Unplug will make lots of people want to take a seat and try it for themselves. 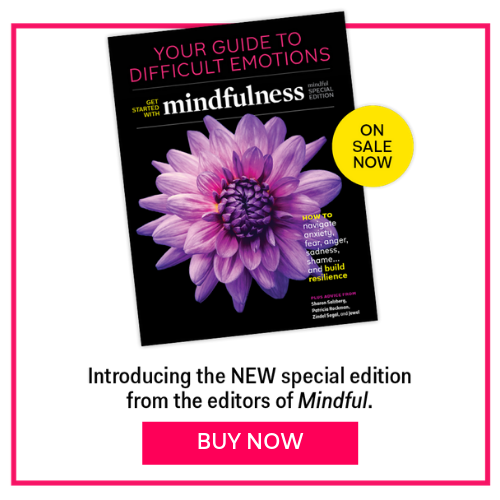 How seriously should we take the claims made on behalf of meditation and mindfulness? How solid are the studies on their benefits? Host Bob McDonald talks to some heavyweights in mindfulness research. The bottom line? Well, it’s worth a listen.